Charter a boat on your next OBX vacation! Reel 'Em In on the OBX! Welcome to some of the best fishing waters in the world! Outer Banks fishing is more than just a sport - it's a huge industry and a historic way of life on our barrier islands. There are endless opportunities for Outer Banks fishing adventures - surf fishing, pier fishing, charter fishing, fly fishing, bridge fishing and sound fishing are all readily available on the OBX. Spend a leisurely day casting your line from the shore, or go after the big boys on an Outer Banks charter fishing trip. One of the great things about Outer Banks fishing is that anyone can participate. Novice anglers can find all the equipment and advice they need at local Outer Banks bait and tackle shops. Outer Banks fishing piers are another place for beginners to have a great fishing experience. Outer Banks fishing is also a fantastic activity for kids and teens - it's a hobby that can turn into a life-long love. Traditionally, Outer Banks fishing peaks in the late spring and fall when water temperatures are moderate. During this time, many fish move through the Outer Banks on regular migration patterns providing a smorgasbord for eager anglers! However, Outer Banks fishing is definitely a year-round sport. Each season offers something for Outer Banks anglers. Whether you're an angler looking for the catch of a lifetime or a vacationer looking for some fun, the folks at Corolla Bait & Tackle can help. With two locations in the Northern beaches, extensive knowledge and experience the waters of the Outer Banks and a variety of fishing workshops, Corolla Bait and Tackle is your one stop shop for everything fishing on the Outer Banks. 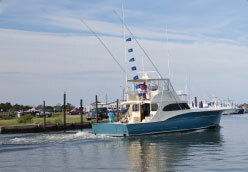 Visit their website here, and start planning your Outer Banks fishing getaway!